The only forbidden word in our house “WALK”. You have never sensed the stillness that overcomes until Molly perks up her piggy tail like ears and stares at you whilst making herself believe it is true. She then frantically runs to the laundry room door and chases her tail until you grab the leash. Her favorite place to walk : Tanner Park. The most fabulous off leash park in the valley. There are miles of nature trails and a stream that runs through the whole park. It is the only non-watershed swimming available in the easily accessible area. 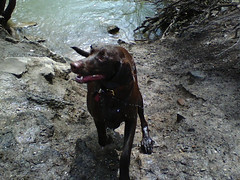 Molly loves to swim and we peruse this great place 4-5 times a week. As you can see, labs were definitely bred for duck hunting…..
For 3 more pictures click on the link!